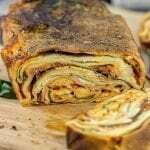 Love lasagna? 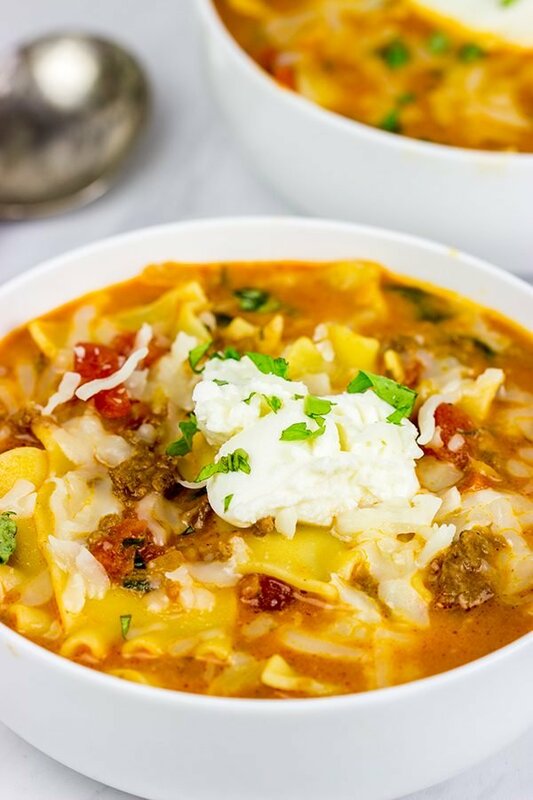 Then you’ll love this Lasagna Soup! It’s perfect for a cold winter day! I love cartoons. If you’re a regular Spiced reader, then you’re probably well aware of my love for Scooby Doo, Wile E. Coyote, Wacky Racers and Gossamer (i.e. the hairy orange monster that chases Bugs Bunny around). But my first cartoon love? That would have to be Garfield. I seriously loved Garfield when I was a kid. I had stuffed Garfield and Odie animals. I would eagerly jump at the Sunday newspaper and read the Garfield comic first. I had (still have…) a number of Garfield comic books. And my sister even gave me this Garfield cookbook for Christmas this past year. I mean, who doesn’t need 230 recipes inspired by a cat!? Did you know that Garfield’s favorite food is lasagna? Yup, lasagna. That’s because Garfield was born in Mamma Leoni’s Italian Restaurant. He developed such a love for lasagna that Mamma Leoni either had to choose between the restaurant and Garfield. She chose the restaurant, and Garfield was soon adopted by Jon Arbuckle…and the rest is history. If you think about it, a lazy cat with a sarcastic attitude and a unwavering love for Italian food makes for a pretty good cartoon character. In fact, for a few short weeks back in 1994, I tried my hand at drawing my own cartoon strip. The main character in my cartoon strip bore an uncanny resemblance to Odie. I have no idea what Garfield thinks about soup, but he loves lasagna. So I’m going to go out on a limb and say that Garfield would love this Lasagna Soup. This soup is seriously amazing. Laura got into this soup while I was out at curling one night, and I got a series of text messages proclaiming her undying love for this soup. Ok, undying love is a bit extreme, but the point remains. 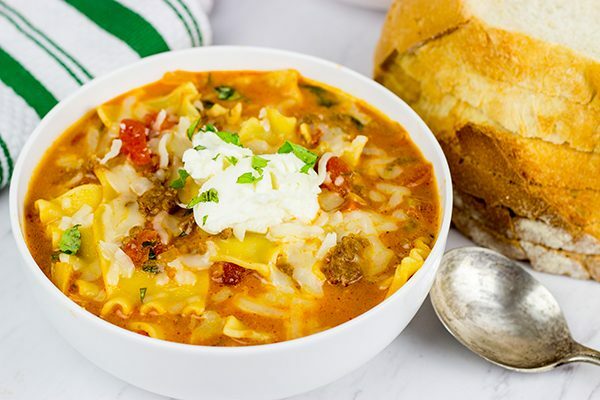 This Lasagna Soup tastes just like the classic Italian dish…just in soup form. And it’s delicious! One of the best parts about this Lasagna Soup? It’s quick and easy! I thought about adapting this one for the slow cooker, but I just made it on the stovetop instead. This one is ready in just about 30 minutes or so, and I can promise that the family will come running once the smell of this soup drifts through the house. Heck, you might even end up with a smart-alecky orange cat waiting for his serving of this Lasagna Soup! Enjoy, my friends! Using a large stockpot or Dutch oven, add olive oil and place over medium-high heat. Once hot, add onion and sauté for 5-6 minutes, or until onion just begins to soften. Add beef, garlic, oregano and parsley. Break up ground beef with a wooden spoon. Continue cooking over medium heat, stirring occasionally, for 4-5 more minutes or until beef is browned. Add tomato paste, sugar, salt and pepper. Cook, stirring frequently, for 2-3 more minutes. Add chicken stock, diced tomatoes and tomato sauce; stir and cover. Allow soup to come to a simmer. Uncover and simmer for 15 more minutes. Meanwhile, cook lasagna noodles according to package directions. Once cooked, stir noodles, chopped basil, Parmesan cheese and heavy cream into soup. Spoon soup into bowls. Sprinkle tops of bowls with a bit of shredded mozzarella and a spoonful of ricotta. Garnish with additional chopped basil, if desired. Speaking of stars – I can understand Laura pledging her undying love for this soup – lasagna in soup form is amazeballs – and added kuddos it’s ready in 30 minutes! I’m *sure* Garfield would be all over this soup (probably burning his tongue, too)! I loved Garfield as a kid, but I don’t think I ever heard the backstory about being born in an Italian restaurant – how funny! This definitely looks like my kind of soup – nice and hearty. Hey, what’s not to love about a sarcastic, fat cat who eats lasagna? Haha! Man, I lived for Sunday mornings and the Garfield comic strip when I was a kid. (And if I still got the paper, then I would still read the funny pages first…some things never change!) This soup is super tasty…and it comes together pretty fast. Thanks, Mara! Stay warm up there! Garfield is an awesome character, and since he does like lasagna, he must be considered the best one. Don’t you think so? 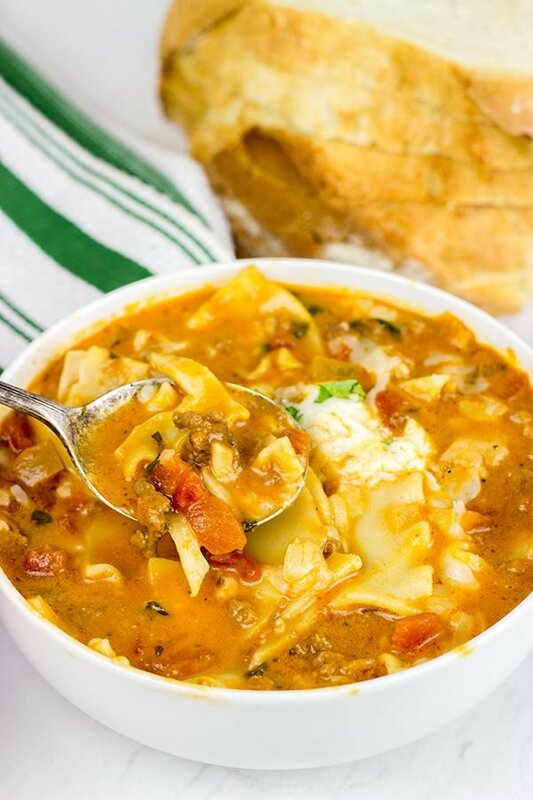 This lasagna soup must be considered the best comfort soup ever, too! The combo of meat, cheese, tomatoes, and herbs is just perfect. You should send a jar or two to Garfield. What? Don’t you have his address? Well, don’t worry! I know it. Ship this delicious soup to me, and I forward it to him then. Promise I won’t even touch it:) Does this plan make sense, David? Absolutely! Any cartoon character that likes lasagna is bound to be a favorite in my book. 🙂 So I don’t have Garfield’s address, but I just saw that link that Shashi left above…and apparently Garfield is set in Muncie, Indiana. Go figure! I’ll ship this soup to Muncie, and see if Garfield finds it. 🙂 You should go there and help him…you know, just to be nice and all! Thanks, Ben! Hahaha! Yes! Get in my belly for sure, Johlene! 🙂 This really is a pretty easy recipe…and it’s one heck of a delicious soup for chilly winter days. Hope your week is going well, my friend! Hi David. I’ve seen lots of recipes of lasagna soup, but they were either way to cheesy or under seasoned. Your soup sounds perfect, although I always add spinach to my lasagna so I would probably add it to this too. This soup looks and sounds really yummy! Do you remember the Garfield stuffed animals that had suction cups on all of his feet, so you could hang them on the inside of your car window? Thanks for taking me back to the 80’s (maybe 90’s, I can’t remember). Yes! I totally remember those suction cup Garfields, Mindy! Did you have one in your car? I had forgotten about those until I read the “20 things you didn’t know about Garfield” link that Shashi shared above. Man…those things were everywhere! 🙂 I really appreciate your comment, my friend! lasagna soup? wow such interesting flavors! I need to try this! OMG this looks so good David, I had to pin it before I read anything you had to say. I’ve never had lasagna soup and I think it’s the biggest tragedy of my life, ok not of my life but you get the picture. OMG I love cartoons also, Scooby Doo is a classic and Garfield was hilarious. I had an oversized Garfield stuffed animal when I was young, who doesn’t love a cat that eats Lasagna. Ohhh this looks like a fun cook book. Robbie is a riot! Like Father Like Son. Slow cookers soups are about all I can handle right now. This year has been crazy busy and we are only a few months in. Wow…thank you so much, Mary! I really, truly do appreciate you pinning this one. 🙂 So you need to go make some lasagna soup…ASAP! (Just leave the ground beef out of your version. In fact, Dorothy above suggested adding spinach…and that sounds amazing! 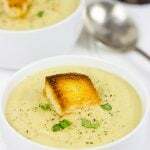 Plus, this soup only takes about 30 minutes to make!) So go read some Garfield comic strips while eating lasagna soup…how much fun does that sound like right now? Haha! I loved Garfield too – growing up, it was my absolute favorite of the ‘newspaper funnies’ as my Granny called them. I didn’t remember that his favorite food was lasagna – smart kitty!! And how smart are you?? You’ve taken the majority of the fuss out of making one of the most delicious foods there is. Thank you for this genius idea. Will be trying your recipe soon. Yeah, that Garfield knew what he was talking about! I mean what’s not to love about a sarcastic cat that eats lasagna? 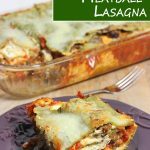 🙂 You are indeed right that lasagna is one of those labor of loves types of meals. But this soup? It’s ready in about 30 minutes. And it’s super delicious! In fact, I just picked up the ingredients to make another batch…it’s supposed to get cold here again this weekend, and soup is on the menu! Thanks, Marissa! This soup sounds delicious, David. And in 30 minutes! I feel a serious lasagna soup craving coming on. Dude! I am so making this this weekend. Have everything so no trip to the store and I think it’s an awesome idea. Have a great weekend. Yes! Meals that don’t require a trip to the store are always the best, aren’t they? This soup is a keeper, Kevin! In fact, I’m gonna make a big batch of this one this week to take in for after my curling game. 🙂 Hope you are feeling better, my friend! Dude…someone needs to trademark that soft toy dropping antics as it’s clearly the new workout- The older they get, the harder it is- HIIT! Haha! You started a (fun) trend! 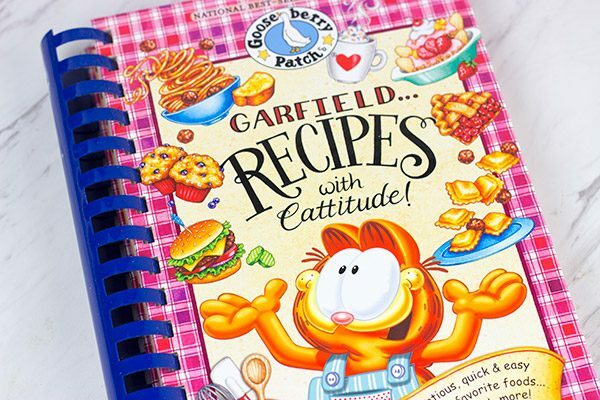 Now a Garfield inspired cookbook? This is awesome and even moreso that Lasagna was a hit- I loved Garfield comics, especially all the underlying sass! 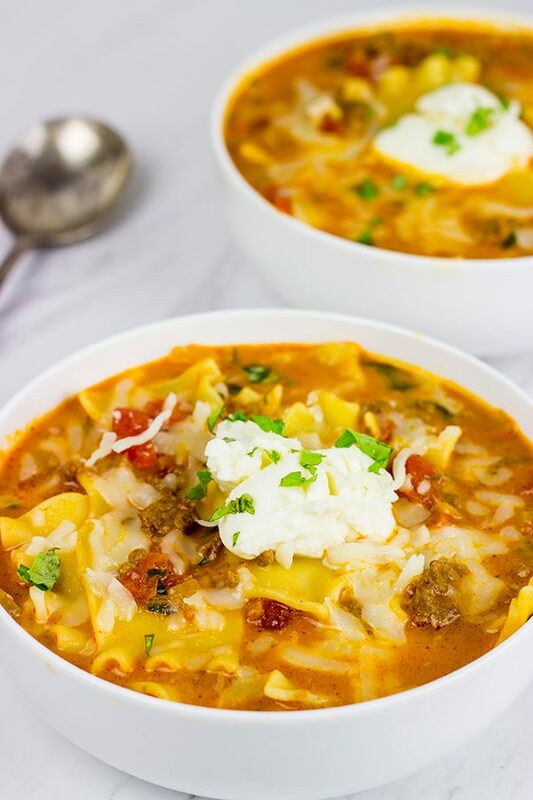 This lasagna soup screams comfort! Ooooo, this is speaking my language. I am printing and making this for sure. And I love that there’s a Garfield cookbook. Thank you so much, April! This is one heck of a good soup…and I have it on the agenda to make again this week. 🙂 And I agree with you about Garfield…nothing beats a sarcastic cat who eats lasagna, right? Hah! Thanks so much for swinging by and commenting…and I really hope you enjoy this soup! I make lasagna soup as well. It’s really a brilliant idea. Great post! Thanks so much, Mimi! 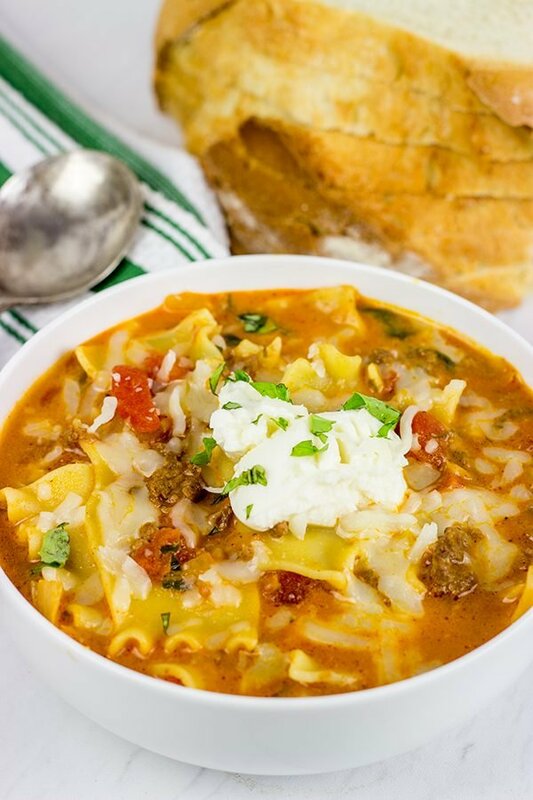 I love lasagna, but it’s a labor of love…that’s why lasagna soup is just awesome, right? It’s so much faster, but equally as delicious! 🙂 I appreciate you stopping by and commenting!